Established in the year 2016, Livealth Biopharma Private Limited is a vertically integrated pharmaceutical company manufacturing and exporting of advanced, high-quality, affordable generics drugs and APIs.We are committed to providing safe, effective and affordable medicines to the people. We are focused on continually improving the way we do business. We have our own brand named Livealth. 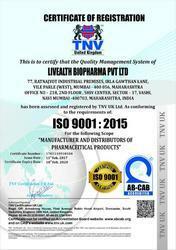 Livealth Biopharma Pvt Ltd is ISO 9001;2015 Certified Company. Quality Assurance is perhaps the most critical and demanding parameter in the Pharmaceutical industry that we understand. Our strict in-house quality monitoring facilities makes it possible for us to achieve the most stringent and exacting standards of quality. We have been manufacturing & Exporting the best quality Pharmaceutical formulations for our demanding customers. We make use of the finest raw materials in all our manufacturing operations. Our Vision is to become a global player in pharmaceutical industry to facilitate the access of common person to the high tech life saving generic drugs are affordable prices throughout worldwide. Livealth Biopharma Private Limited is a pharmaceutical company that develops, manufactures high-quality and affordable generic drugs for improving and extending the life of an ever increasing number of patients in many countries.